The Church of The Good Shepherd Mile Oak in north Portslade, is situated north of the Southern Cross traffic lights on the Old Shoreham Road (A270) via Locks Hill, to South Street turning right into Valley Road and proceed to the end of this road and at the junction at Chalky Road turn left and second right into Stanley Avenue where the Church is situated on the right. At The Good Shepherd there is a car park next to the Church. 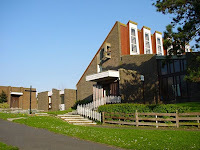 The Brighton & Hove Buses routes 1 and 1A stop close by the Church in Chalky Road & Graham Avenue. These routes connect Portslade and Mile Oak with all parts of the City, across to Whitehawk at the eastern end of the route. In the late 19th century “Mile Oak” an area of north Portslade consisted of very few houses, a Victorian Waterworks and the “Paddocks”. In Edwardian days the Paddocks was a popular tea garden and model farm where race horses were bred and trained and there were also sports facilities catering for tennis, croquet,cricket and football. Between the Wars there was a rapid growth of house building in Mile Oak and the Vicar of St Nicolas, Revd. Ernest Holmes, decided that a mission church should be built. In March 1936 a site in Stanley Avenue was purchased from Mile Oak Estates Limited and a “Tin Hut” donated by the Good Shepherd Mission Church in Dyke Road, Brighton, was erected on this new site. The “Tin Hut” was formerly a cook house and mess room at Shoreham Airport’s First World War Military Camp. 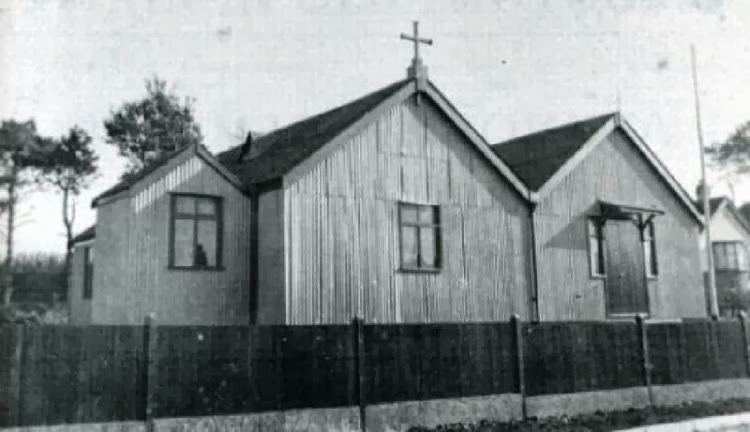 The “Tin Hut” consisted of two 50ft by 20ft standard army huts side by side , the north hut the Church and the south hut the Church Hall. The cost of erecting the “Tin Church” was £437,13s, 11d. which was entirely raised by the people of Mile Oak. 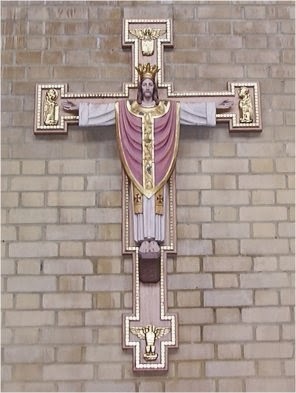 The Church of the Good Shepherd was dedicated by the Bishop of Lewes on the 9th November 1936. In the 1950’s the “Tin Church’s” roof was replaced and the building's exterior tin walls were refaced. 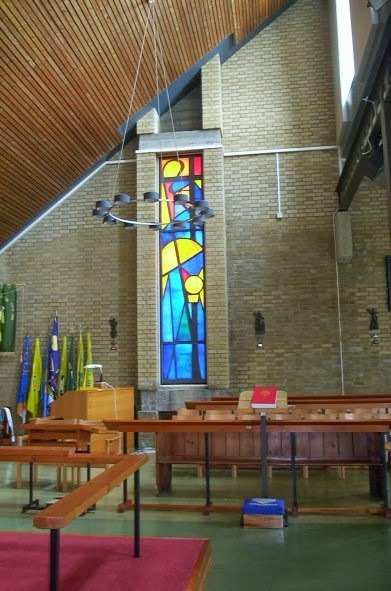 The foundation stone of the new church to replace the "Tin Church" was laid on 7th June 1963, designed by M G Alfold and built by the George Comber Company, a well known Portslade builder, at a cost of £25,000. 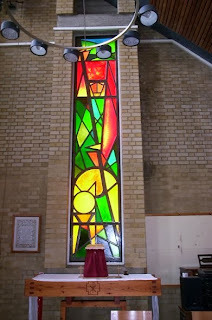 The new Church was dedicated by the Bishop of Chichester on Saturday 28th October 1967. In 1969 The Good Shepherd Mile Oak became a conventional district Church. 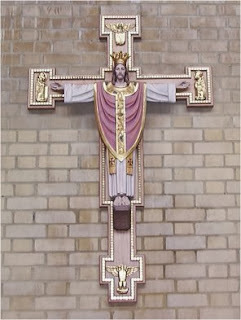 The Good Shepherd status was changed from a “conventional district Church” when it was consecrated as a Parish Church by the then Bishop of Chichester, The Rt. Revd. Eric Kemp, in November 1994. In September 2013 The Good Shepherd united with St Nicolas & St Andrew Portslade to form the new "Parish of Portslade - St Nicolas and St Andrew and Mile Oak The Good Shepherd".